Book Advertisements for Hindu Instantly! Welcome to Hindu Newspaper Ad Booking Portal. Use this portal to book any Newspaper Ad instantly online for Matrimonial, Property, Recruitment, Public Notice at the lowest rates. Pay via Credit Cards, Debit Cards, UPI, Net Banking or Cheque. Welcome to The Hindu Newspaper Ad Booking Portal. Use this platform to book classified or display Newspaper Ad in The Hindu instantly online for Matrimonial, Property, Recruitment, Public Notice at the lowest rates possible. Pay via Credit Cards, Debit Cards, UPI, Net Banking or Cheque. Are you worried about getting contacts, rates, deadlines and want to avoid the hassles of manual booking procedures for your Hindu classified ads? Your search ends here! Now you can book your newspaper classified text and display ads via releaseMyAd - India's largest, INS accredited newspaper ad booking portal. Just 3 simple steps and your ad is booked for the scheduled date. You can also avail the best rates and discount packages for your Hindu classified advertisements only at releaseMyAd. Get started! Q. I need to book an ad in The Hindu for a property I’m willing to rent in Chennai. I cannot find any agents in my locality. Is there any way to book them online? Q. What are the Education Plus rates for a display ad to be released on a weekday, as per convenience? Also help me with some education ad samples? Q. Please provide me with the ad rates for a Business ad that needs to go on the first page of the Hindu. Why advertise in Hindu Newspaper ? WHY ADVERTISE IN Hindu NEWSPAPER? According to the Registrar of Newspapers for India, The Hindu boasts of a massive readership of over 22.6 lakhs and an average daily circulation of about 15.58 lakhs. Having the lineage of publishing cutting edge editorials and reliable news pieces from all over the country, it has gained the Numero Uno rank among all newspapers circulated across the entire South India. Offering highly economical ad rates and multiple advertising options such as text and display classifieds for small and medium traders and display ads for big budget brands has made it a popular and feasible advt medium for all. Keeping in mind the convenience and budget constraints of advertisers, Hindu provides a range of offers and packages which makes publishing multiple ads across multiple locations a cake walk and also ensures considerable savings for you. With releaseMyAd, the long standing official ad agency for The Hindu newspaper, you can now book your Hindu classified and display ads online anytime from anywhere in 3 simple steps. HOW TO BOOK AD IN Hindu NEWSPAPER? The next step takes you to the Compose Ad page where you can create and design your Hindu advertisement with the help of existing templates and highlighting features such as tick,border,bold etc. releaseMyAd also provides you category wise ad samples for reference. Complete the booking of the ad on the Dates & Payment page by specifying the ad release dates and making the final payment via our online or offline payment media which include Credit/ Debit Card , Net banking, Demand Drafts, Cheques and NEFT (Online Cash Transfer) to Cash Collection from home and offices. Preview your ad content as it will appear on the publishing day as well as get an email confirmation instantly once the booking is done. Visit our Question & Answer Forum for The Hindu for any more queries. Also feel free to call,mail or chat with our experts anytime for further assistance. 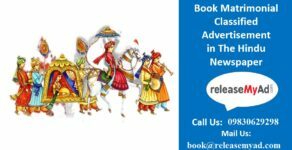 releaseMyAd enables you to review the rates, circulation details, packages and everything else related to advertising with the Hindu, since we are the Authorized Online Ad Booking Agents. Now you can get your ads booked and released in Hindu, instantly in just a few clicks online, only with the help releaseMyAd’s integrated digital platform. You can start with the booking and leave the website, after you have completed your payment for your ad. Having been associated with Newspaper Advertising for more than 30 years, we understand the pains of getting a newspaper ad printed in a newspaper, therefore we offer you with a complete one-stop solution for it. ReleaseMyAd is the largest and most trusted online newspaper ad booking site and we have been recognized & certified by the Indian Newspaper Society (I.N.S)-the primary governing board for all media publications. Classified Text: Text ads, also referred to as run-on line ads, are the most common and primary form of newspaper advertisement. These are simple ads in words and are much larger in number than other ad types. They are also the cheapest form of newspaper classified advertising for all newspapers. Classified Display: Classified Display Ads in Hindu, which are most often referred to as column adverts are an advanced form of classified advertising. They are like display ads in the fenced within the classified section that have some restrictions in their size. They are priced based on per sq. cm unit as per the space occupied by your ad. You can create your ad with the help of online design templates in both coloured and B/W format. Display: Display advertisements are the most extravagant form of newspaper advertising. They can be published on any page and can occupy any amount of space in a specific newspaper page. They too are charged in terms of their size in per sq.cm unit. You can even upload your own ad design in .PDF/.JPEG/.EPS/.TIFF format and provide the specification separately. You shall receive an email confirmation after confirming the ad booking and clearing the payment for the same. This ensures that your ad is ready to be released in the Hindu as per your preferred dates. You may consult our Question & Answer Forum of Hindu for more queries related to advertising in The Hindu. Classifieds Ad Sections LocationsFAQ Why Hindu?